State governments rarely bother about national priorities such as exports and imports. Except when the commodity is the hilsa fish, the state is West Bengal and the people concerned are Bengalis. Shortly after the Trinamool Congress came to power this year, the state's Commerce and Industries Minister Partha Chatterjee announced he would request neighbouring Bangladesh to lower the export price of its hilsa. The soaring price of the fish had cast a cloud over the Trinamool's talk of good governance. Chatterjee's leader, Chief Minister Mamata Banerjee, while negotiating a cash bailout for the bankrupt state government she inherited from the Left Front, did not forget to slip in a word about the hilsa to Prime Minister Manmohan Singh. Could the Prime Minister please talk to the Bangladesh government and get it to lower the export price? Overfishing and other factors like pollution have reduced the catch on the Indian side of the border and the price of the fish has soared to a band of Rs 600 to Rs 1,500 a kg this monsoon, more than double last year's levels. 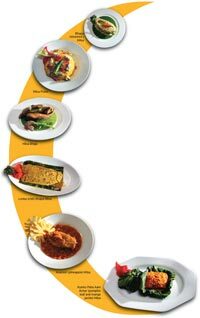 The price depends on the size - the larger ones are tastier and thus costlier. The shortfall is bridged by imports from Bangladesh, whose government has done better at protecting what is one of its prime export items. The passion for the bony fish in West Bengal has increased since Partition and the 1971 war when millions of Bengali Hindus, the Bangals, had to leave what was then East Pakistan, where the best hilsa is still found, and cross over to India. Though West Bengal is the largest producer of freshwater fish in the country, and has a wide variety of them, the hilsa rules the heart of most Bengalis. But when the price of a decent-size fish crosses Rs 1,000 a kg, as it did this season, it can also break hearts. 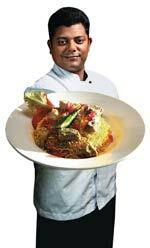 Bhaskar Dasgupta, Chef-in-Charge of Oh! Calcutta in Delhi, holds a plate of Hilsa Pulao. The hilsa or Tenualosa ilisha is found in most perennial rivers in Asia that empty into the region's seas, from Iraq in the West to Myanmar in the East. Species can differ, and so can the taste. Much like the salmon of North America, the hilsa, or ilish in Bengali, enters the river from the sea to swim upstream for hundreds of kilometres and spawn. Then it returns to its salty abode. Hilsa from the sea is tasteless; in the river it is delicious. One possible trigger for the transformation in taste: during the monsoon, the swollen Hooghly river carries plenty of detritus - goodies for the fish - into the ocean and the hilsa gorges on this in preparation for its marathon round trip from sea to river and back again. Before the Farakka barrage was built on the Ganga in north Bengal, the hilsa used to be spotted as far upstream as Allahabad. Today, it is rare to find it even at Kolaghat near Kolkata. Sandipan Chakrabortty, a hard-core Bangal, says there was a time when the ilish would be on his menu every other day. Nowadays, he eats it two days a week at best. "The pleasure lies not only in having ilish yourself, but in treating others. Today, it is difficult to afford the second," says Chakrabortty, Managing Director of Tata Steel Processing and Distribution, the new identity of Tata Ryerson. "The best ilish are the ones that weigh 1.5 kg to 2 kg apiece, but these cost over Rs 1,000 a kg and you have to place an order in advance." Chakrabortty recalls how, during his childhood, his family would fuss about buying "joda ilish" or a hilsa pair, and getting them "married" in an elaborate ceremony, before they were cooked. The hilsa is not sliced up and sold in parts, unlike say the rohu, because its tail and head - unlike that of many other fishes - are not in demand. Those who cannot afford the big fish buy the smaller ones weighing less than 500 gm apiece and it is overfishing of this size that has sent stocks dwindling. Kalyan Majumdar, Secretary of the East Bengal Club, whose supporters are traditionally Bangals, says the high price has taken away whatever nostalgia was left for it. "We d o n ' t wait eagerly for a piece of ilish during the monsoon any more. The reason is nothing but the cost," he says. There was a time when East Bengal football supporters would celebrate the team's victory by buying the fish. Mani Shankar Mukherjee, the renowned Bengali novelist who writes under the pseudonym Shankar, says the Bengali craze for hilsa is not reflected proportionately in Bengali literature. But there is folklore. There is one story about Swami Vivekananda, he says, travelling down the Padma river in 1899. A fisherman offered him 16 hilsas - presumably the large ones - for Rs 1, adding four more free. Vivekananda then stepped ashore to look for pui saag, a type of green, together with which he would cook the ilish dish. A villager had pui at home, but wanted to be accepted as Vivekananda's disciple in return for parting with it. Swamiji agreed. All for the hilsa. High prices have not deterred chefs of fancy restaurants from letting their imaginations soar. When they run out of mustard recipes, they even try hilsa biryani. While anathema to purists, a hilsa biryani can be an entry point to those otherwise scared of the bones, as the hilsa pieces are picked free of bones before being cooked along with the rice. Mukherjee says the hilsa has 10,000 bones, and this has prevented Western menus from appropriating it the way prawns have been. The Oh! Calcutta restaurant chain, as the flagbearer of Bengali cuisine, cannot do without the annual hilsa festival. Indranil Palit, Chief Operating Officer, says it tries to catch the season early, but after prices stabilise. "This year, the price was very high when the season started in June, at Rs 650 a kg for a 800-gm fish," says Palit. "The hilsa vanished for some time shortly after we launched our festival." Luckily, Oh! Calcutta had enough stocks to continue. Earlier, it was a taboo to consume ilish during October to February - from Dashami (Dussehra) to Saraswati Puja - when the hilsa eggs hatch and return to the sea. Globalisation has done away with the idea of seasonal foods, it also means that the hilsa can reach Bengalis across the world. Sudip Chatterjee, who has been living in Dubai for the past six years, says he gets the fresh ones weighing between one to 1.5 kg at 55 dirhams (Rs 675) per kg, and the smaller frozen ones at 30 to 65 dirhams a kg. "But even in Dubai the hilsa is priced way above other fish such as the rohu which costs 12 to 20 dirhams a kg, The frozen ilish is the tastiest," he says. The ilish has even reached Tokyo - and not as sushi. "Recently I had some ilish paturi (ilish steamed in banana leaf) in Tokyo," says Chakrabortty. "Out of the world!" The West Bengal government continues to make noises. Madan Mitra, Minister for Sports and Fisheries, promises his party will provide cheap ilish. "We have schemes to bring the prices down," he says, but offers no details. So far, the magic has not worked.